I just found out that my blogs ("erniemcpeck - Adventures in Switzerland" and "Swiss Red") were mentioned as part of a broadcast by World Radio Switzerland last Thursday. As part of their regular feature called "The Connectors", presenter (and blogger) Catherine Nelson-Pollard discussed the My Big Geneva website with Michael Shevlin (another blogger and local teacher), and as a side note also mentioned my own blogs. What an honour! The My Big Geneva website is a fantastic source of information, and quite rightly the focus of a programme discussing expat experiences here, as it has a ton of articles on what to do in Geneva. Before talking directly to Emilie and Carla of My Big Geneva, Catherine mentioned my blogs as an example of a British expat who blogs about life in Switzerland. You can listen to the programme through the WRS website, or download it directly through this link. I always find it incredibly flattering whenever anyone mentions my blogs, as with my recent interview on the Expat Dads Who Blog series on the Geneva Family Diaries website. It humbles me just to know that people read what I write, and I sincerely hope that what I blog about can help other people in some small way. I would like to express my thanks to Catherine and WRS in general for mentioning my blogs, which are also linked from their website. In return, I would like to encourage others to tune in to WRS, either through 101.7 FM in the Geneva region or by streaming through their website. Listening to shows such as The Connectors can help you find information from other expat sources that could be interesting or even helpful to you. - I've mentioned my appreciation for this website in past articles, after they first came to my attention when they asked me to do an interview for their series on Expat Dads Who Blog. Michela runs a very tidy and information-packed website that is mainly focused on Geneva but also stretches to the surrounding areas, and is a great source to check if you want to find out what's going on in the coming days or weeks. - The Know It All Passport is a guide book for English-speakers in the Geneva and Vaud regions of Switzerland, and this website supports the book with expanded information and articles. As you would expect with a guide book and an accompanying website, it is absolutely jam-packed with information on what to do and where to go in these areas of Switzerland. Having read some sample pages, I think this just might be next on my list of books to read! - A brilliant website written my Meta, an expat mother of two who lives in Lausanne and blogs about very wide-ranging subjects related to daily life in Lausanne as well as things to see and do in other parts of Switzerland. She also has loads of great ideas for things to do with kids, with many articles on craft ideas that will come in very handy during the winter months when the kids can't go outside! - This was a cracking blog by Linda who moved to Switzerland from her native Sweden. She blogged about her views on things in life, which were often unrelated to Switzerland, but amongst the articles about fashion or movies she liked there were some real gems, such as "Sweden vs Switzerland", where she compared the pros and cons of the two countries (Sweden won). Sadly she no longer blogs here as she moved back to Sweden earlier this year, but historically it's still a good read. - This blog is written by The Connectors presenter Catherine Nelson-Pollard herself, providing a view of life in Nyon from a British expat. Lots of information about life in Switzerland can be found here, as well as articles for tourists visiting the area and upcoming events. It's another website that I wish I had found out about sooner, and this is now firmly in my list of sites to follow. Catherine also runs a blog about life in Switzerland called "The Perpetual Expatriate", giving her view on life here. - This is a web magazine written with expat mothers in mind, that aims to share information amongst international women living here in Switzerland, with topics ranging from daily life to fashion tips. It's an interesting read, even from a male perspective! - A blog written by Michael Shevlin, who was part of the WRS The Connectors broadcast that mentioned my blogs, on his views on life, which are written with a kind of humour that strikes a chord with me (quote from his Snow Driving Tips article in January: "...the motherland has had a couple of inches of snow so the whole country has come to a complete standstill and people have started eating their pets..." - funny stuff!). A good read that will make you chuckle. - Written by an American living in Switzerland, this is a useful and often humorous look at life in here, albeit in the German part of the country. A good read and full of useful info, it's a good place to go for English-speaking expats. - A website dedicated to helping people who are moving to Switzerland, with helpful info on orientation and how to settle in and adjust to life here - why have I only just found out about this site?? It has loads of useful blog articles that would probably have come in handy to me had I read them over three and half years ago! If you are in the same situation as I was - i.e. about to move to Switzerland - I sincerely recommend this blog! 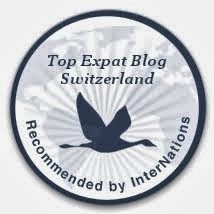 A useful list of blogs from expats here in Switzerland is also available through the Expat Blog website, here.